There are a lot of mighty, crafty and potent races out there in the Galaxy - from the Wookie to the Trandoshan, but while they're beating down the front door, who's picking your back pocket? The Jawa Pilferer, that's who. Unassuming, small and generally beyond notice, Jawas are the perfect race to play if you'd rather pop out of the shadows instead of coming in with guns blazing. 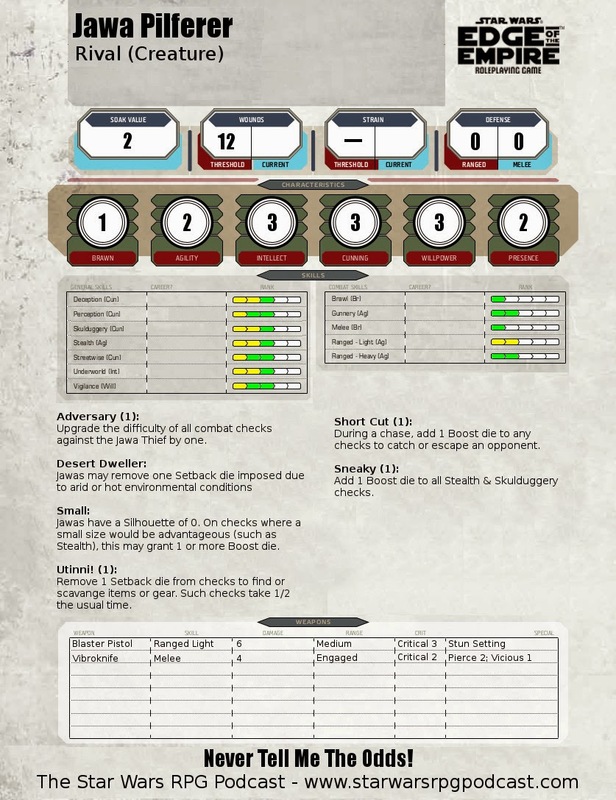 Get a Jawa into your game with the stats below for the Jawa Pilferer, a crafty thief who uses her size to sneak into places she shouldn't be - and get away again! Jawas are famously native to the desert planet of Tatooine, but their proclivity for scavenging, tinkering and generally being where they shouldn't means they tend to pop up in places you wouldn't expect them (just ask R2-D2). 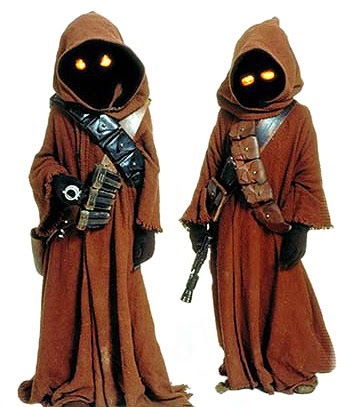 While official stats for Jawa characters don't exist yet, there's no reason you wouldn't run into one of these curious, mechanically minded folk on working on a spacer barge, trying their luck on other planets, or even working as a bounty hunter. The stat block above is perfect for a stealthy opponent who can harry your PC's by lifting some important piece of equipment and making off with it. The Pilferer isn't much good in single combat, so she probably has some muscle to back her up lurking right around that next corner. Along with her Shortcut ability, a tricky GM should make good use of the Jawa's small size to shake pursuit by ducking into vents, under vehicles, or out small windows.